The main access road into a Howard Johnson’s hotel in Raleigh, NC had experienced significant settlement since its construction ten years earlier. The primary cause of the settlement was decomposition of a sanitary landfill over which the road was built. Up to a foot of differential settlement had occurred in some places. The geotechnical engineer was retained to evaluate the most cost-effective method to correct the settlement problem prior to reconstruction of the access highway. Law Engineering considered a number of alternatives, however, the only cost-effective one that was also environmentally safe was to dynamically compact the material. An eight ton tamper was used from drop heights of 60 feet. Crater depths of up to 6 feet were recorded. Residual micaceous fine sandy silt was used as the crater backfill material. The equivalent subsidence of the roadway due to the dynamic compaction was approximately 2.5 feet. 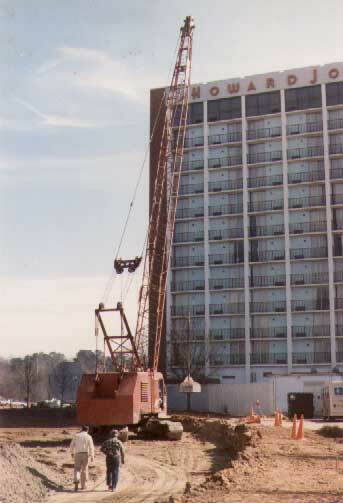 Dynamic compaction operations were complicated by the close proximity of the Howard Johnson’s hotel. Tamping was performed within 25 feet of the pile-supported hotel without damage. Detailed vibration monitoring was performed for protection of the structure.